This is a great opportunity for European, Baltic and Russian cruise itineraries to explore this great city, full of history, culture, and customs. Get to know the real Russia with your own eyes on one of our cruise shore excursions from St. Petersburg! All our St. Petersburg cruise excursions including multilingual and English speaking, federally certified shore excursion guides and transportation and of course the Russian visa service. No need to pay for over-priced cruise line and cruise ship shore excursions in St. Petersburg, with our shore excursions, your visa is included and assistance guaranteed if needed. We offer the absolute best options for your tours and cruise shore excursions in St. Petersburg, Russia! Round trip transportation from your St. Petersburg cruise ship terminal! Professional, licensed driver air-conditioned transportation! 2 day private guided excursion with English speaking and certified shore excursion guide! "Blanket" Visa for Russia is included for the duration of your St. Petersburg sightseeing shore excursion! Visit Fountain Park in Peterhof, Catherine Palace with the Amber Room, St. Peter and Paul Cathedral, Church on Spilt Blood, Hermitage Museum, St. Isaac's Cathedral and Yusupov Palace! Entrance fees to all museums in the program and metro visit! Early admission to the Hermitage Museum! Boat ride and hydrofoil ride! Traditional Russian style lunch for both days! All port fees and taxes! Small groups only, personalized service - 16 maximum! Experience St. Petersburg's best highlights with this 2-day excursion. You will visit the top sights of the city such as Peterhof, Catherine Palace, Hermitage Museum, Yusupov Palace and many more! Transportation and lunch are included so the only thing you have to do is relax and enjoy. Air-conditioned, fully licensed and insured private excursion transportation! Bilingual professional private St. Petersburg shore excursion guide! Other languages speaking guides available, please check notes! Admission fees to all the sites visited! Services of a licensed local driver! All port fees, local taxes and the cost of blanket Russia tourism excursion visa included! 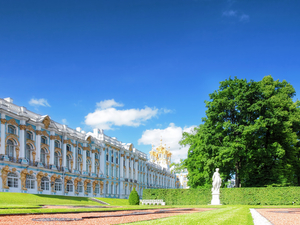 Guests will visit The Catherine Palace, Podvorie Restaurant, and The Hermitage Museum! 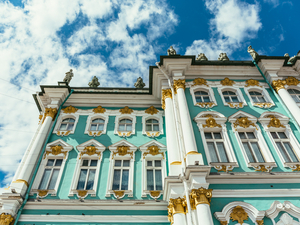 Come with us and experience the days of opulence and royalty as you explore both Catherine's Palace and the Hermitage Museum. Private guide and excursion transportation! Included are lunch at the famous Podvorye restaurant, a Russian Folkloric Show, and even a blanket visa! One way ride on board a Hydrofoil Boat! 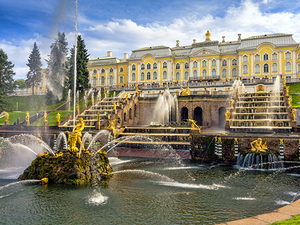 Guests will visit and skip the line: Peterhof Palace, Grand Palace, Lower Gardens! 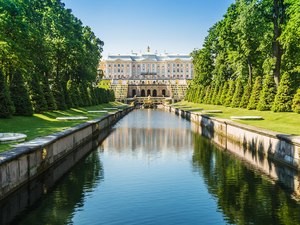 Come and experience the wonders of St. Petersburg during this private, half-day cruise shore excursion to the magnificent Peterhof Palace and its impressive fountains and Lower Gardens. No waiting, skip the line! See many wonders of the palace known as Versailles by the sea on the hydrofoil boat ride. Visit Fountain Park in Peterhof, Catherine Palace with the Amber Room, Church on the Spilt Blood, Hermitage Museum, Faberge Museum, and St. Isaac's Cathedral! Photo and video permissions at museums (except for Faberge museum)! Traditional Russian Lunch for one day! Small groups only, personalized service - 12 maximum! 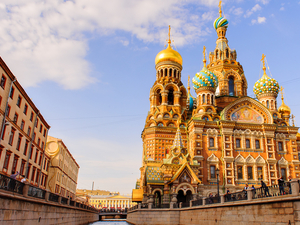 Join this 2-day St. Petersburg Excursion and discover some of the best attractions in the city. 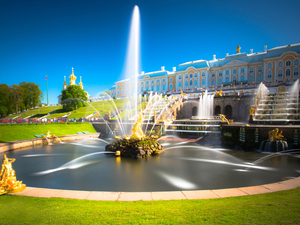 Admire the fountain park in Peterhof and the Amber Room at Catherine Palace. 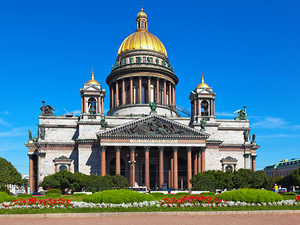 Visit the Hermitage Museum and Faberge Museum as well as St. Isaac's Cathedral. See it all, you'll love it! Visit: Fountain Park in Peterhof, Catherine Palace with the Amber Room, Church on the Spilt Blood, Hermitage Museum, St. Isaac's Cathedral! Entrance fees to all museums in the program (including the early entrance to the Hermitage Museum)! A boat ride and walk along Nevsky Prospect! This adventure will provide an intimate looking into one of the world's most captivating cities. The grandeur, history, and culture of Russia will be passionately presented in this uniquely crafted small group excursion. Don't forget your camera as you will want to capture these memories to share for a lifetime. Private bilingual professional St. Petersburg shore excursion guide! Moika and Neva River canal boat cruise! Panoramic views of Yusupov Palace, St. Isaac's Cathedral, Stroganov, Peter and Paul Fortress, Marble Palace, Summer Gardens, Church of Spilled Blood, Nevsky Prospect, St. Nicholas Cathedral, Decembrists Square and more! Photo stops at St. Isaacs Square and Aurora Cruiser! Make the most of your visit to St. Petersburg with this private excursion and see some of the best sights this beautiful city has to offer. No rushed feeling, no cruise ship crowds and you will explore the city by boat and coach. Be sure to bring your camera, there will be photo stops along the way. Round trip, air-conditioned transportation from your St. Petersburg Russia cruise ship terminal! One Day guided excursion with English speaking and certified shore excursion guide! "Blanket" Tourist Visa for Russia is included for the duration of this sightseeing cruise excursion! Visit the Fountain Park in Peterhof, Catherine Palace with Amber Room, Church on the Spilt Blood and Yusupov Palace! Entrance fees to all museums in the program! Packed lunch and bottled water! Small groups - maximum 16 guests! This Monday Full Day excursion has everything you want to visit in St. Petersburg. You will admire both Catherine and Yusupov Palace, the magnificent Church on the Spilt Blood and the beautiful Fountain Park at Peterhof. This would be a day to remember! Visit the Fountain Park in Peterhof, Monplaisir Palace (Catherine Block and Bath Block), Hermitage Museum and Church on the Split Blood! Entrance fees to all museums in the excursion! Visit some of the most amazing places in St. Petersburg. You will visit Monplasir Palace, walk through the beautiful Foutain Park at Peterhof and see the magnificent Church on the Spilt Blood. 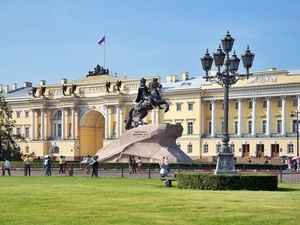 You will have the opportunity to visit the Hermitage Museum too! 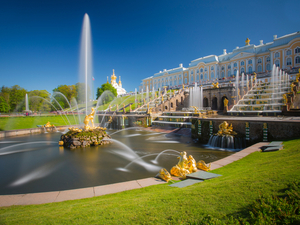 Visit the Fountain Park in Peterhof, Catherine Palace with Amber Room, Hermitage Museum and Peter and Paul Cathedral! Light lunch and bottled water! Enjoy a perfect day with this St. Petersburg Excursion, small group, full-day excursion and visit some of the top sites in the city. 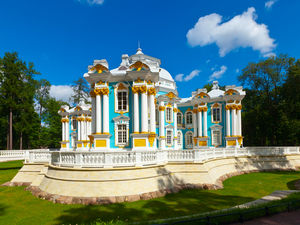 Enjoy a walk in the Fountain Park at Peterhof, admire the magnificence of the Catherine Palace. Explore the second largest museum in the world - Hermitage Museum and see the Peter-and-Paul Cathedral. 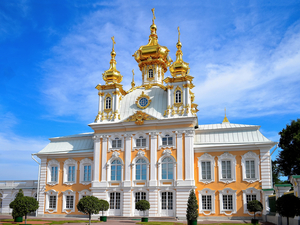 Visit the Fountain Park in Peterhof, Catherine Palace with Amber Room, Hermitage Museum and Church on the Split Blood! St. Petersburg is unique and with this small group, full-day excursion, you will have a taste of the best sites. You will visit the Fountain Park at Peterhof, Catherine Palace, Hermitage Museum and the Church on the Spilt Blood. Great sightseeing at an affordable price! Round-trip route with on/off privileges in St. Petersburg! Easy to use St. Petersburg Sightseeing Excursion Map! Multi-lingual audio narration on the sightseeing bus - available in 10 languages! Stops at the must-see sites, the highlights of St. Petersburg! Escape the cruise ship shore excursion crowds and enjoy unique sights of St. Petersburg! Enjoy a unique sightseeing shore excursion of St. Petersburg city and its amazing highlights. With 20+ designated sightseeing stops, you choose the ones you want to get off at and then re-join the bus. Enjoy up to 48 hours of sightseeing fun. All port fees, taxes and the cost of blanket Russia tourism excursion visa included! Guests will visit Metro Station, Farmer's Market and the Russian Vodka Museum! Come and experience the daily life of St. Petersburg, the second largest city in Russia. While exploring historic St. Petersburg, see the city in a unique way on this shore excursion from St. Petersburg cruise port. 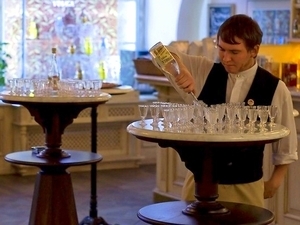 Visit the metro, markets, local shops and even a Vodka Museum! Round trip transportation from your St. Petersburg cruise terminal! Admission fees to all the sites and St. Petersburg Cathedrals visited! Services of an English speaking professional licensed private St. Petersburg shore excursion guide! Private driver's services and modern car/deluxe van or motor coach with A/C! All port fees, local taxes, and cost of blanket Russia tourism excursion visa! Guests will visit: St. Issac's Cathedral, Spilled Blood Cathedral, Peter and Paul Cathedral! 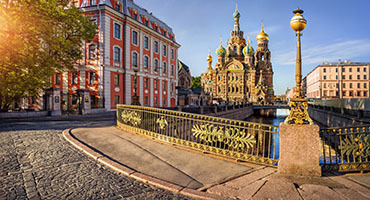 Come with us and view St. Petersburg's many Orthodox Cathedrals with this private Cathedrals Excursion and your private, English-speaking Russia sightseeing shore excursion guide. Leave behind the cruise ship crowds. Blanket visa is included! All port fees, local taxes and the cost of blanket Russia tourism excursion visa! 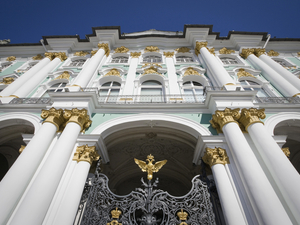 Guests will visit The Hermitage Museum including the Winter Palace, Small Hermitage, Old Hermitage and New Hermitage! No waiting in line - you get to skip it! 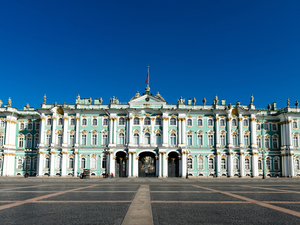 Embrace the exquisite beauty of the most spectacular museum in St. Petersburg during this scenic and memorable Private Shore Excursion to the Hermitage Museum in St. Petersburg Russia. All port fees plus the cost of blanket Russia tourism excursion visa! All local taxes and fees! Guests will visit The Catherine Palace (Gardens, Picture Gallery, Green Dining Room and Great Hall)! 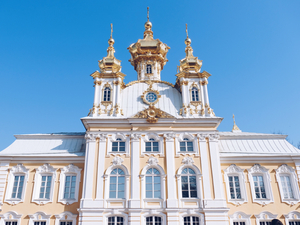 Come with us and explore the magnificent beauty of Catherine's Palace on this half-day private St. Petersburg Excursion with your personal private sightseeing excursion guide and transportation. No waiting in line! Your blanket Russia visa is included with this exclusive private day sightseeing cruise excursion. All port fees, local taxes and the cost of blanket Russia tourism cruise shore excursion visa! Guests will visit Peterhof Palace, Grand Palace, Lower Gardens! Round trip transportation from your Saint Petersburg cruise ship terminal! 2 day guided excursion with English speaking and certified shore excursion guides! "Blanket" Visa for Russia is included for the duration of the excursion! Complimentary traditional Russian lunch on both days and bottled water! See the best sights of St. Petersburg! See the best highlights of St. Petersburg! Enjoy two days of a unique guided sightseeing cruise shore excursion with lunch included both days! Best city sightseeing shore excursion in St. Petersburg, Russia! Round trip transportation from your St. Petersburg Russia cruise ship terminal! Air-conditioned, fully licensed and insured cruise shore excursion transportation! Bilingual professional private St. Petersburg sightseeing guide! 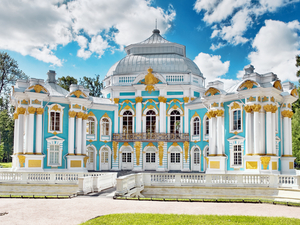 Admission fees and skip the line ticket to Catherine Palace! Services of a licensed and insured local driver and transportation! 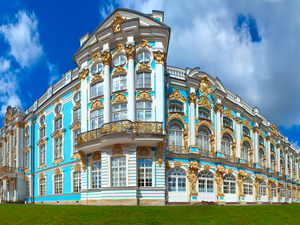 Guests will visit The Catherine Palace (Gardens, Picture Gallery, Green Dining Room, and Great Hall)! 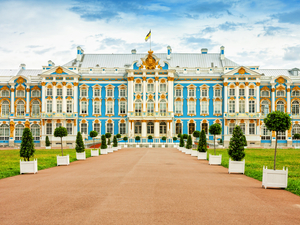 Come with us and explore the magnificent beauty of Catherine's Palace on this half-day private St. Petersburg shore excursion with your personal private sightseeing excursion guide and transportation. No waiting in line! Your blanket Russia visa is included with this exclusive private day sightseeing cruise excursion. Round trip, air-conditioned private transportation from your St. Petersburg Russia cruise ship terminal! 1-day Private guided excursion with English speaking and certified shore excursion guide! Professional, licensed driver and award-winning St. Petersburg shore excursion operator! See the best sights and highlights of St. Petersburg city! When your cruise ship is only in St. Petersburg for one day, make the most out of it on this ultimate private sightseeing and highlights sightseeing shore excursion of St. Petersburg City, Russia! Professional, licensed driver and round-trip air conditioned quality Mercedes transportation (private)! 3 day private guided excursion with English speaking and certified shore excursion guide! 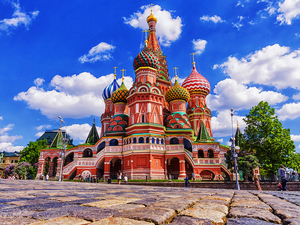 "Blanket" Visa for Russia is included for the duration of your 3-day cruise shore excursion! All entrance fees and admission costs! See the best sights of St. Petersburg city! 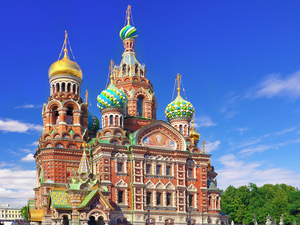 Pack the most into your cruise visit to St. Petersburg Russia on this private shore excursion. You set the pace. 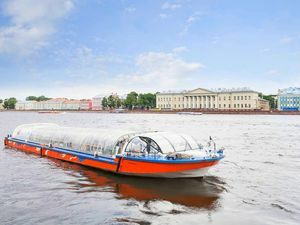 See the best sights and highlights on this 3-day city sightseeing cruise excursion from your St. Petersburg cruise ship terminal. See the best sights of St. Petersburg city including Peterhof, hydrofoil ride, Peter and Paul Fortress, St. Isaac's Cathedral, canal boat ride, Catherine's Palace, Amber Room, State Hermitage Museum, and Church on Spilled Blood! 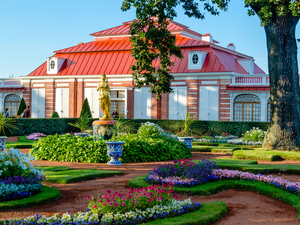 Skip the line tickets into Peterhof Grand Palace and Catherine's Palace! All entrance fees, admission costs, and taxes! This is your opportunity to see the most of what St. Petersburg, Russia has to offer. See the best sights and highlights on your private 2-day St. Petersburg city sightseeing cruise excursion. Bilingual English speaking professional private St. Petersburg shore excursion guide! Guests will visit and skip the line: The Hermitage Museum including Winter Palace, Small Hermitage, Old Hermitage and New Hermitage! No waiting in line - you get to skip it! 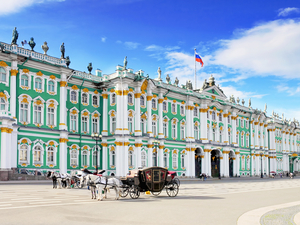 Embrace the exquisite beauty of the most spectacular museum during this scenic and memorable Private St. Petersburg Excursion to the Hermitage Museum. Tasty typical Russian and local lunch included! Guests will visit Peterhof Palace (Grand Palace and Lower Gardens), Summer Palace Restaurant, Isaac Cathedral and Peter and Paul Cathedral! Experience the grandeur and scenic splendor of St. Petersburg during this memorable and private all day St. Petersburg Excursion. You will enjoy exploring the Peterhof Palace, St. Isaac’s Cathedral, the Peter and Paul Fortress and so much more. Fully licensed and insured boat ride! Guests will visit: The Faberge Museum and take a Canal sightseeing boat ride! View the fabulous Faberge Museum with its famous Faberge Eggs and enjoy a unique and relaxing way to view St. Petersburg riding on a fun canal boat on this unique St. Petersburg Cruise Shore Excursion. Round trip, air-conditioned transportation from your St. Petersburg cruise ship terminal! Blanket Visa for Russia is included for the duration of this Moscow sightseeing shore excursion from St. Petersburg! 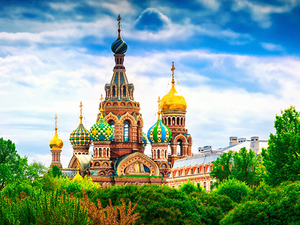 Enjoy a privately guided excursion of Moscow! English speaking and certified shore excursion guides! 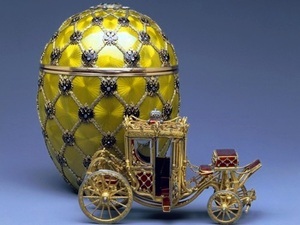 Guided visit of the Kremlin and the Armory - see Faberge eggs and Orlov Diamond! See Red Square, St. Basil Cathedral, Lenin's Tomb, GUM shopping complex! Photo stops and scenic city sightseeing! Enjoy lunch at the Artist's Gallery Restaurant! Snacks and beverages on the train to Moscow! Dinner and beverage on the train to St. Petersburg! Private small groups only, personalized service! Your private day cruise excursion in Russia to remember. Experience the mystery, history, and beauty of Moscow, Russia! Enjoy a guided excursion of the Kremlin and all round trip transfers from St. Petersburg cruise terminal with your English speaking shore excursion guide.